The fellow who isn’t trying – who isn’t even playing – is often the first to criticize the fellow who is. And this small and mean and annoying human practice extends into the field of our relations with our Creator. The irreligious man – the chap who never goes to church – delights in reciting the faults and sins of religious people. This is a peculiarly simpleminded form of hypocrisy, because it ignores all the complexities of human nature, and the almost endless complications of the struggle for sanctity. It is also almost a dead giveaway. We cannot ever really judge anybody, but we may be sure that there is something wrong with the spiritual life of the man or woman who is quick to find fault and slow to praise. Often there is something very wrong with that person’s psychological life, too. He is trying to build himself up by tearing the other fellow down. He may not realize this, but more often than not it is a deep-seated cause of his critical attitude. Another profound cause is lack of charity – that is, of love of God and fellowmen. Whoever really loves the other chap will be instant in recognizing and mentioning his virtues and achievements, and slow to speak of his sins and failures. When the other fails, he will either help him to his feet, or look the other way. He will not point a finger and shout at the crowd to draw attention to the fallen figure. If he does, he is not at all like God; and to be like God is our business. We would all be in a frightful position if we were to be treated by God as most of us treat one another. Christ was asked point-blank by St. Therese, the Little Flower, whether her faults displeased Him. His answer was no. What other answer was possible? Sin alone displeases God; and faults are not sins. Faults are simply failures due to the fact that we are human beings and not angels. A dish may slip from our fingers and shatter, simply because we are human. Nothing of the sort could happen to an angel. But what of those who exaggerate and over-punish not merely the mistakes and faults, but the sins -the real sins – of others? The damage that they can do to the spiritual life is incalculable. They can discourage people who are striving for holiness. They can even cause people to stop trying altogether. In that case, they run the frightful risk of being responsible, in large part, for the loss of an immortal soul. Let the irreligious and the carping man scoff and scorn all he pleases; the fact remains that most of us achieve holiness not by soaring in a jet-like flight, but by falling and rising, falling and rising, stumbling and getting up and going on. Only a foolish person is shocked by the sins of others. The wise man knows that wounded human nature will fall. He expects it to fall. He is never surprised by its falls. He is not specially concerned over its falls; what he cares about, chiefly, is spurring others to keep on trying. Christ carrying the cross to Calvary is a picture of the ordinary spiritual life. Spiritually, Christ could not fall; being God as well as man, He could not be like us in that. But in all else He was like us. His body, like ours, could grow weary, could collapse under a burden. But when Christ fell under His cross, He did not stay down; He struggled to His feet and went on. The true Christian is like that in his spiritual progress. He does not run to the heights; he staggers, he weaves, he falls, he rises, he struggles, he fails, but he never gives up. Those who stand scoffing at him are like those who stood hooting at Christ walking the way of the cross. But no decent man wants to be like the hooters. The decent man wants to be like Simon of Cyrene; he wants to lift part of the burden, and encourage the burdened one to go on, and to go on going on until at last he achieves success. Where else than in the family do we have a better right to demand that everybody be like Simon of Cyrene? If a husband and wife cannot be helpful to each other, and to their children, to whom can they be of service? If they carp and nag, if they scoff and find fault, if they exaggerate every fault and sin to the proportions of final failure, will not they destroy the spiritual life in that home, and with it the happiness that ought to be present? It is the duty of parents to be Simons of Cyrene. Simon did not ask whether Christ was guilty or innocent. That was not his concern. His task was to help somebody who needed help. And it is likewise the task of fathers and mothers to take up the burdens of their children, to lead the way forward and upward, and always to encourage and never to discourage. Children will sometimes be guilty; but guilty or innocent, they have the right to be able to turn with confidence to their parents. This confidence is something that parents must earn. They must earn it day in and day out, beginning with the moment when their little ones are taking their first faltering steps. Children are entitled to know from long experience that no matter how far they may fall, in no matter what depths they may become mired, they can be sure that when they turn to their parents, they will be received with understanding and sympathy, and will be helped. Queen Bee Apron! Feminine and Beautiful! Fully lined, quality material, made with care and detail. Available here. We must do everything we can, to not only return to modesty and purity in dress and behavior, but also to help others return to it through good example and knowledge. This is a guide, designed for girls who would like to please Our Lord more and make reparation for those who do not honor Him. This is designed for the young child through kindergarten age to learn a little of their Faith through the alphabet. Its an ABC book that includes Catholic holy images to learn the alphabet, along with the short and long sound for the five vowels. This is so well put. Thank you!!! 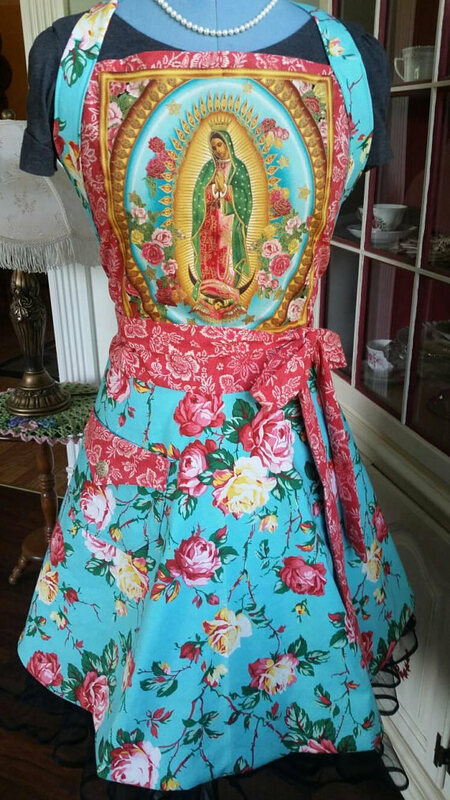 What a pretty apron! Beautiful workmanship!